Indoor Cycling a low impact way to raise your heart rate, burn some calories and increase your lung capacity. So if you haven’t given it a try yet, maybe you should get into it now. And when you do, you are going to need to get some proper cycling shoes. You could use those sneakers that you wear for going to the store, running on the treadmill and taking your dog for a walk but after your first class wearing proper cycling shoes you will wonder how you ever managed without them. You have running shoes for running, dress shoes for date night and now it is time to get some cycling shoes for indoor cycling. Before you say “but they are so expensive” take a minute to read the following 10 advantages to owning a pair, then realize that they will last for years. When you get yourself a pair of cycling shoes make sure they are a snug, but comfortable fit. You don’t have to get the latest model with all the new bells and whistles. A simple Velcro fastener and lightweight are probably the main 2 criteria s you should be looking for. The indoor cycling class will result in minimal wear and tear to your new footwear. When indoor cycling first started the indoor bicycles had SPD (Shimano Pedaling Dynamics) cleats on one side and road bike cleats on the other. In those days some riders would bring in their own pedals and switch them with the ones that were on the indoor bikes. These days there are two types of pedals on the indoor cycling bike, SPD on one side and Look Delta on the other side. With a cleat your foot is in the perfect position. When you buy a pair of shoes, the cleats are sold separately. You can get TRUE Ride to fit them for you if you like. The great thing about cleats is that you can adjust them to the way your legs and feet line up on the pedals. Ideally they will be straight but maybe you broke your leg and your foot points slightly to the left or right. You can adjust the cleat to accommodate this. Here are 10 reasons why cycling shoes are the best choice for indoor cycling classes. The stiffer the sole the better the power transfer you get when pedaling. This means that less power is lost as the shoe flexes or bends around the pedal so more power goes from your leg to the pedal the faster you go. Once you use cycling shoes in the class you will realize another huge advantage of having them is the fact that you can help lift your pedals on the up stroke when pedaling. This smooth’s out your pedal stroke. It takes some pressure off your quadriceps muscles and brings your hamstrings into the exercise. You will soon be pedaling like a professional. Most spinning shoes do not have laces so you don’t have to worry about them getting caught around your pedals. The shoes are tightened very efficiently with either Velcro or a ratchet system. The Velcro fasteners are usually lighter than the ratchet systems. Once you get used to the click in and click out it becomes second nature. Your spinning shoes should be lighter in weight which will again make you more comfortable and your feet won’t feel as tired. It’s possible to buy very light shoes made from carbon fiber but the price does become a bit high. 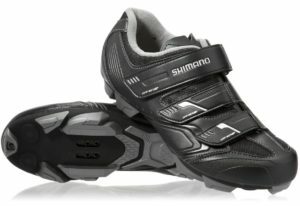 Regular cycling shoes are pretty light and still affordable. Unless you are a professional racer the difference of a few grams shouldn’t make too much of a difference in your performance. 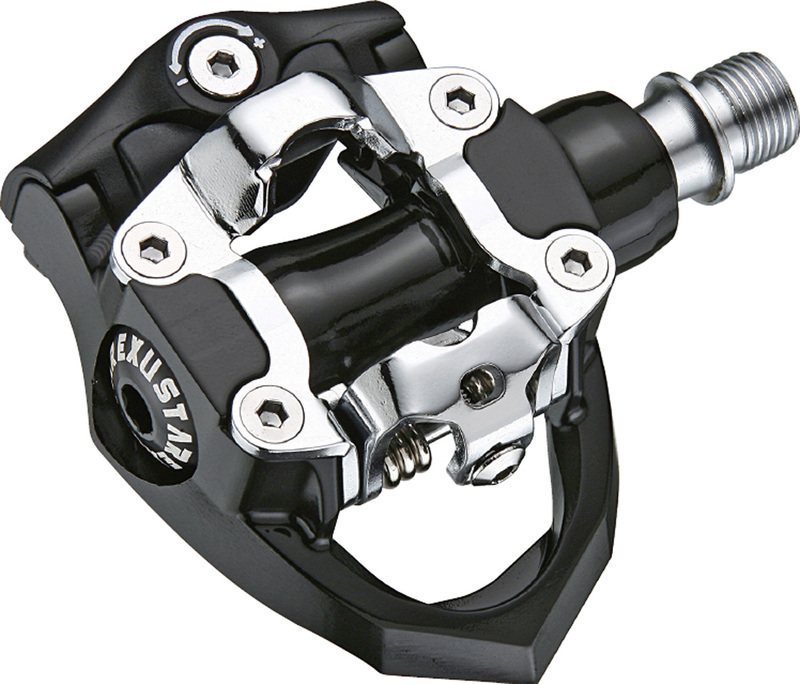 With no chance of your shoe moving, you will be able to increase your power on every pedal stroke and get even more benefit from the class. In conclusion your workout and enjoyment of the class will both improve. Best of all you’re able to try on a pair here at TRUE Ride. No matter how far you go or where you’re cycling, enjoy every ride with the right footwear. 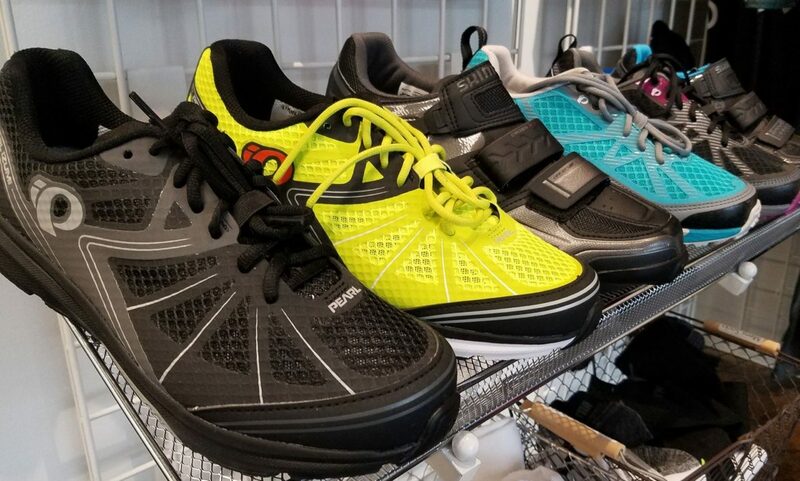 Whether you’re a competitive cyclist, bicycle commuter or crushing some cardio with indoor cycling, TRUE Ride offers a variety of cycling shoes. These bike shoes offer the comfort, flexibility and support you need. They also provide ventilated features for complete airflow and breathability, which is essential. Cycle shoes come in both lace-up and lace-less styles, with many options featuring adjustable straps. 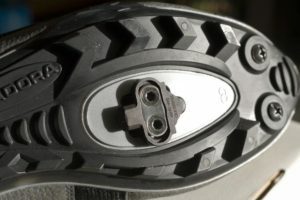 There’s also a variety of cycle shoes designed with an SPD-compatible shank with an optimized cleat zone to help you connect to your pedals. Check out our shoe selection at TRUE Ride. If we don’t have your size, we can place an order and have them arrive to the studio in just a few days.